When we donate our unwanted clothes to charity, we rarely think about what will happen to them: who will sort and sell them, and finally, who will revive and wear them. In this fascinating look at the multibillion dollar secondhand clothing business, Karen Tranberg Hansen takes us around the world from the West, where clothing is donated, through the salvage houses in North America and Europe, where it is sorted and compressed, to Africa, in this case, Zambia. There it enters the dynamic world of Salaula, a Bemba term that means "to rummage through a pile." 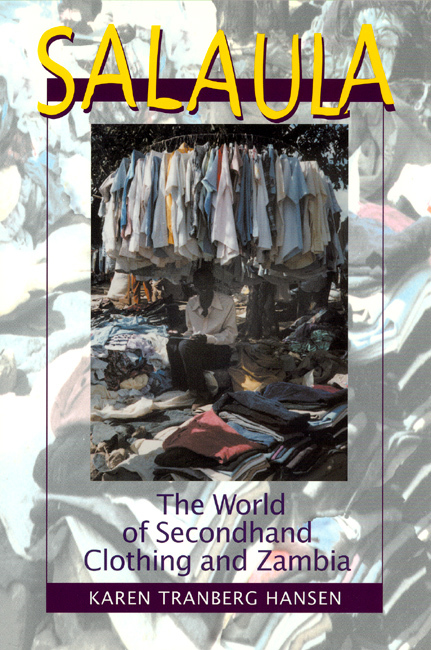 Essential for the African economy, the secondhand clothing business is wildly popular, to the point of threatening the indigenous textile industry. But, Hansen shows, wearing secondhand clothes is about much more than imitating Western styles. It is about taking a garment and altering it to something entirely local, something that adheres to current cultural norms of etiquette. By unraveling how these garments becomes entangled in the economic, political, and cultural processes of contemporary Zambia, Hansen also raises provocative questions about environmentalism, charity, recycling, and thrift.